Get there before it's too late. Vietnam’s Phu Quoc island is set to become the next Phuket. But if you want to truly enjoy it, go now, before mass tourism sets in. 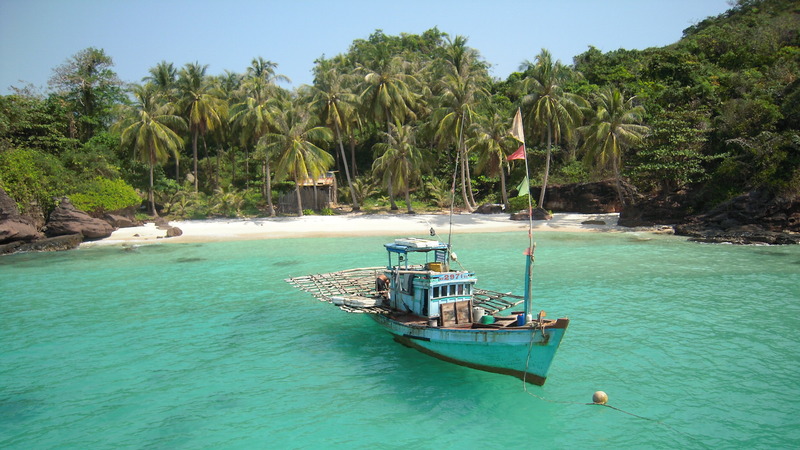 Here at loaded, we want to convince you to visit the tropical island Phu Quoc, 45km off the coast of south Vietnam. It’s a sun-splashed haven roughly the size of Singapore and billed as the next Phuket, but so far less tainted by tourism than the popular Thai destination. Visitors will need to get there soon to enjoy the simple pleasures this relatively peaceful island has to offer. When direct flights launch from the UK this year, the world and his wife are likely to descend. Phu Quoc, also called Pearl Island, was once a backpackers’ haunt, yet a number of five-star hotels now provide an oasis of luxury and calm to those who’ve experienced the bustling madness of Ho Chi Minh City (formerly Saigon) on the mainland, with its cacophony of motorbikes, war museums and chaotic, sweaty markets. Regular direct flights operate from the UK to Ho Chi Minh City, and from there, it’s a 50-minute flight to Phu Quoc. The itinerary allows for a multi-centre break, combining a taste of Vietnam’s frenetic pace of life with paradisiacal island relaxation. One of the hotels is La Veranda Resort, a charming, luxurious boutique hotel on 12-mile Long Beach, the island’s longest stretch of sand in the west. The hotel’s French colonial-style buildings feature rooms devoid of bling, walkways fringed with lush tropical planting, eye-catching bright orange bird of paradise flowers and soft pink hibiscus. It’s a jewel in the crown of the island. Stepping on to its private beach, there are many beachfront bars which have already sprung up alongside it, one of the most popular, Rory’s Bar, being right next door. Refreshingly, there’s no in-your-face, pushy tourism with waiters badgering you to go into their restaurants or hawkers hounding you to buy their wares. There’s a relaxed feel to the pristine sweep of sand, where quiet couples enjoy a drink watching the burnt orange and deep pink hues of the sunset, or head for a smattering of beach barbecues where locals cook freshly-caught fish. Surprisingly, some 50% of Phu Quoc is national park, made up of jungle, mangrove forests and woodland. Some of it is inaccessible, home to macaque and silver langur monkeys, fruit bats and reptiles, including pythons. You can rent a motorbike and attempt to see some of it by dirt track, but the road is rocky, bumpy and often muddy. Phu Quoc is actually closer to Cambodia – just nine miles away – than to mainland Vietnam. Cambodia lays a competing claim to the island, which is why the Vietnamese keep a substantial military presence there and much of the north is off-limits to the public. As well as its beaches and waterfalls, Phu Quoc is famous for its fish sauce (nuoc mam), considered the finest in Vietnam. Much of it is sent to the mainland, but it’s widely exported and you can buy it in specialist shops and online in the UK. Of course, many tourists will end their trip in Phu Quoc after visiting Ho Chi Minh City and cruising through the Mekong Delta, a watery maze of rivers, paddy fields and floating markets, which extends from the city limits southwest to the Gulf of Thailand. Muddy, brilliant green rice fields line the main highway to the river, while along the route, families sit at makeshift stalls selling a hotchpotch of goods, from home-grown vegetables to children’s clothing, gas canisters and motorbike helmets. On the water, pumpkins and pineapples, coconuts and papayas are piled high on traditional sampans (small rowing boats) and larger vessels at the floating market at Cai Rang, the largest in the Mekong Delta, where traders go about their business oblivious to the inquisitive tourists. This is rural, idyllic Vietnam at its best, despite tourism. Let’s hope Phu Quoc can weather a similar storm.